Editor’s Note: Adapted from an article originally published in MYCAT Tracks: The Malaysian Tiger’s Struggle for Existence, Vol 5 2014. Woodland Park Zoo and MYCAT collaborate to enhance tiger and rain forest conservation in Peninsular Malaysia. 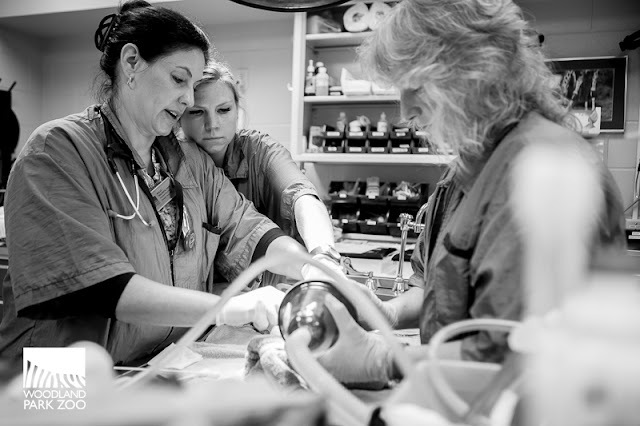 In June 2016, 14 Association of Zoos & Aquariums tiger keepers, including WPZ’s Christine Anne, will travel to Malaysia to participate in a special CAT Walk designed for zoo professionals. CAT Walk volunteers supplement official anti-poaching patrols. Photo: Fred Koontz/Woodland Park Zoo. Footsteps echo in the forest. A group of people hike in a single line along a logging road, their eyes scrutinising the trail for something. They are seen almost every weekend here, in a relatively unknown part of the Malaysian forest, occasionally even spending the night in the forest. Who are these people, and what are they looking for? A poacher's snare hidden in a tree. 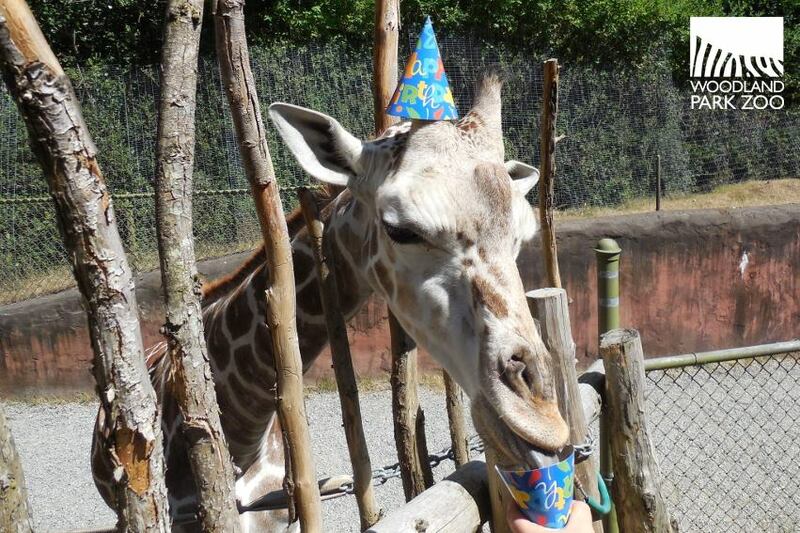 Photo: Fred Koontz/Woodland Park Zoo. They are members of the general public, MYCAT volunteers participating in its flagship programme, Citizen Action for Tigers (CAT). CAT involves citizen conservationists in the protection of an important wildlife corridor along Sungai Yu in Pahang. 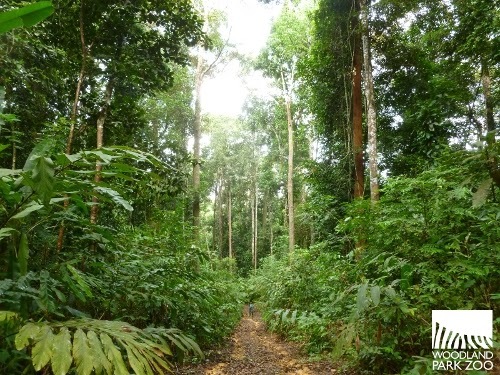 This stretch of forest is divided by a highway that provides ease of access for poachers into the adjacent Taman Negara. The premise behind the CAT programme is simple. Wrongdoers are unlikely to carry out their activities in a place frequented by people, especially those who are alert to the possibility of crimes in progress. Similar to a neighbourhood watch (or Rukun Tetangga for Malaysians), MYCAT has brought this idea one step further — into our forests to jointly safeguard our wildlife and heritage, complementing the patrol efforts by Taman Negara rangers inside the park. Evidence of a poacher’s camp. Photo: Fred Koontz/Woodland Park Zoo. With the ultimate goal of protecting and recovering the tiger population in the corridor and Taman Negara, CAT enables volunteer conservationists not only to deter poaching and encroachment by their mere presence, but also to save wildlife by deactivating snares or traps found during a guided recreational walk. Some tricky walks are guided by local Orang Asli. If volunteers encounter any suspicious activities, they call the 24-7 Wildlife Crime Hotline. MYCAT then relays the information to the authorities for action. In effect, CAT Walk provides much needed boots on the ground and eyes and ears in the forest. And most importantly, CAT Walk slowly but surely nurtures a sense of ownership and stewardship over nature amongst the volunteers, moulding them into future conservation champions. CAT Walkers celebrate finding a cache of snares hidden in a tree trunk. Photos: Fred Koontz/Woodland Park Zoo. Since the programme’s inception in 2010, 550 volunteers of 24 nationalities have detected and deactivated 83 snares, while walking 584 km in the corridor! Presently, MYCAT is seeing a declining trend of threats to wildlife, suggesting poachers are slowly being rooted out from the area. Occasionally, tiger pugmarks or images of sambar on camera traps are starting to welcome volunteers. Data from camera traps allow park rangers to predict routes for anti-poaching patrols. Photo: Kae Kawanishi, MYCAT. Today, CAT Walk is very popular, showing that the public is willing to take up the reins to help protect endangered wildlife. The mantle of responsibility is not only taken up by individual members of the public, but also shared by some corporations willing to donate their staff time to walk the corridor as green corporate social responsibility. Estimated to be 130 million years old, the rain forest of Taman Negara is nearly twice as old as the Amazon rain forest. 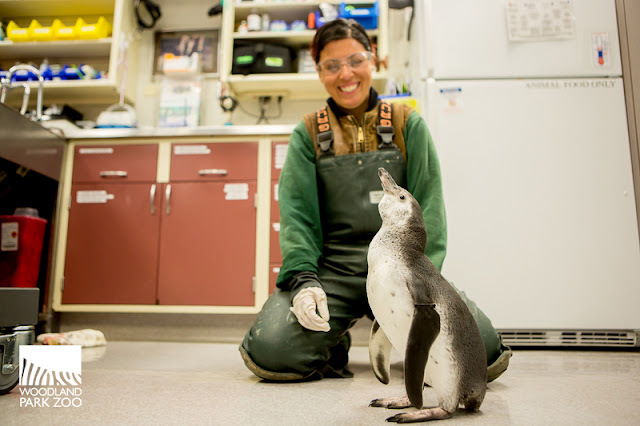 Photo: Fred Koontz/Woodland Park Zoo. Strong support from the public fuels MYCAT’s hope of expanding the CAT programme to other important tiger habitats. Is this possible? Can an individual really make a difference in saving a species nearing extinction? The indisputable answer is yes! Find out more online with MYCAT. Here’s your chance to tell the Washington Department of Fish and Wildlife (WDFW) how much you care about our local animals and habitats. Jim Unsworth, WDFW Director, has announced an exciting new multi-year initiative, Washington’s Wild Future: A Partnership for Fish and Wildlife. The idea is to seek public comments and ideas to strengthen the department’s relationships with communities, increase support for conservation and outdoor recreation, and help ensure the department meets the public’s needs. 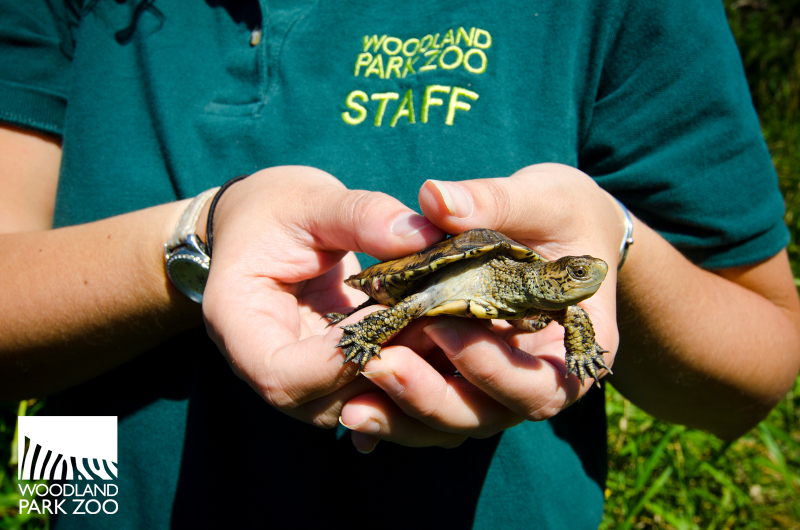 Woodland Park Zoo has partnered with Washington Department of Fish and Wildlife for nearly 25 years, including on the recovery of the endangered western pond turtle. 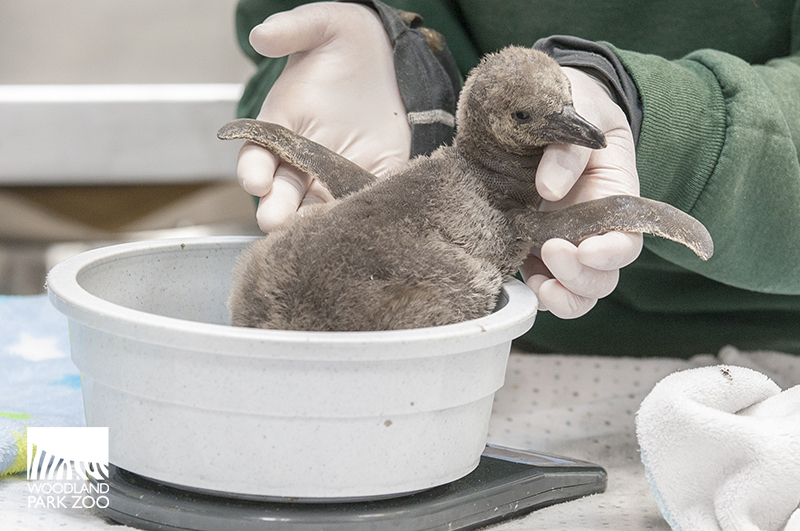 Photo by Ryan Hawk/Woodland Park Zoo. Four regional public forums have been scheduled for October. Each meeting will begin with a presentation about the importance of fish and wildlife to Washington’s quality of life and the economies of its local communities. Participants will then be invited to speak with department representatives, as well as Dr. Unsworth. It is very important that Dr. Unsworth, who is new to Washington and WDFW, hears from the public their strong support for wildlife conservation. I hope you can attend one of these meetings, or alternatively, leave written suggestions and comments on Washington’s Wild Future webpage. 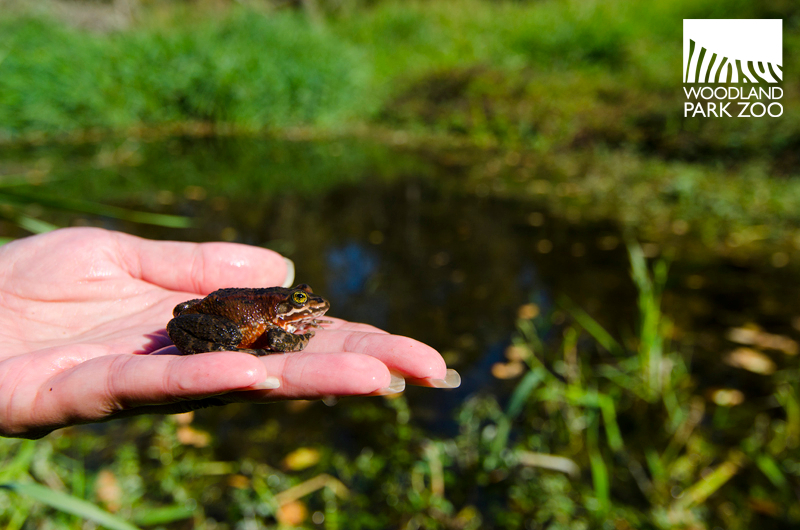 On October 6, zoo staff will release about 750 headstarted, endangered Oregon spotted frogs into their wetlands habitat in Pierce County. Photo by Ryan Hawk/Woodland Park Zoo. 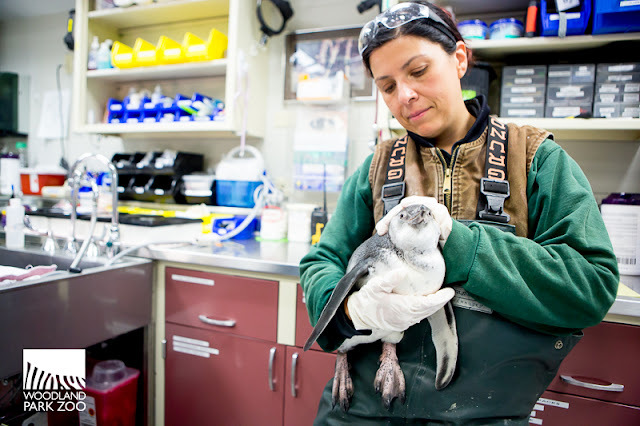 Woodland Park Zoo for nearly 25 years has worked closely with WDFW on a variety of species and wildlife issues, including western pond turtles, Oregon spotted frogs and carnivore conservation. We are grateful for our partnership with WDFW and for their hard work protecting Washington’s rich diversity of fish and wildlife, but at the same time we are concerned about the future of wildlife in our state. Dr. Unsworth’s call to work with the public to build a stronger and more effective Fish and Wildlife is both timely and urgent. A remote camera captures the moment a wolverine approaches a non-invasive hair snare. 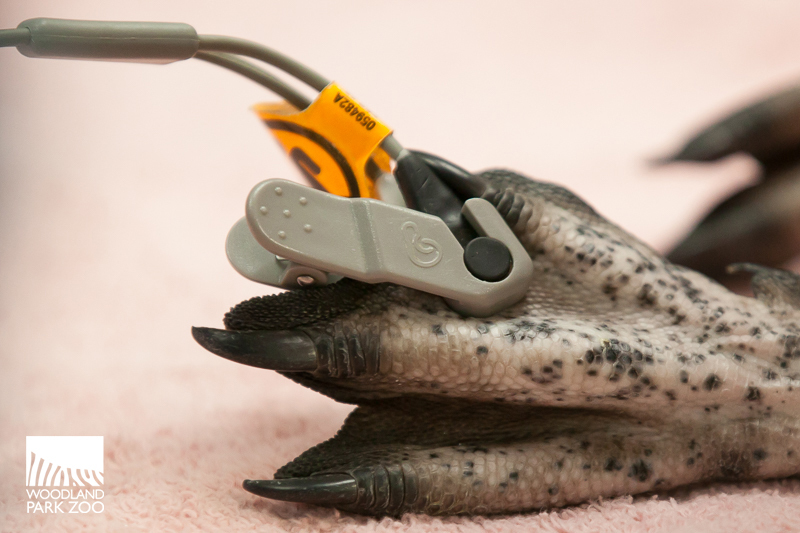 These monitoring techniques, set up by Woodland Park Zoo Senior Conservation Fellow Robert Long, enable researchers to take identifying images and collect hair for genetic research. Photo: Woodland Park Zoo. As human numbers inevitably increase in coming years, development will likely cause significant habitat loss and fragmentation, and as a result we will witness an accelerating number of threatened species. From our perspective, the department should be less reactive and more proactive in addressing biodiversity conservation. 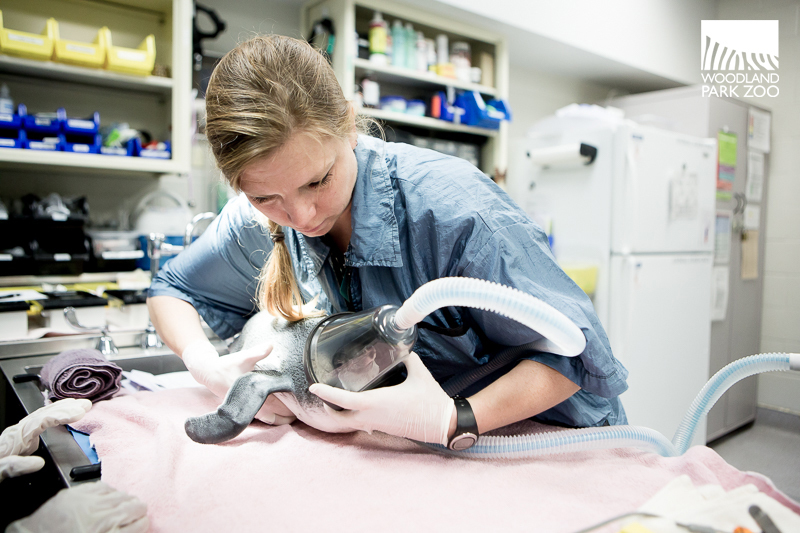 Best management practice suggests taking actions before species become endangered. But this will require additional funds for the department and more strategic and stronger partnerships between WDFW, academia, businesses, civic leaders, citizens, non-profit organizations and other state agencies. In the long run, a more proactive approach to protect all species will cost less and is much more likely to protect human wellbeing and our local economies than trying to rescue endangered species. Plans are being considered by federal and state officials to restore grizzly bears in North Cascades National Park. 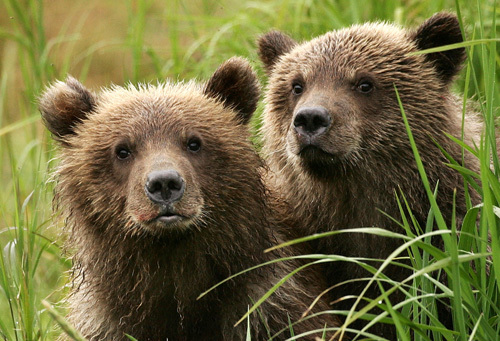 In coming months, when the final proposal is submitted for public review, we will be asking you to speak up for Washington grizzly bears! 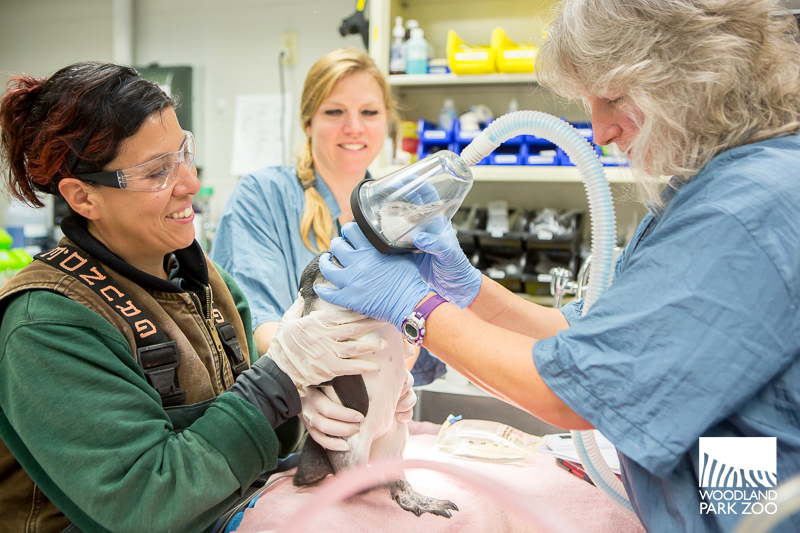 Photo courtesy of Western Wildlife Outreach, a Woodland Park Zoo Partner for Wildlife. • WDFW is currently underfunded and in urgent need of additional financial resources. • Wildlife management decisions ought to be based on science and expert advice, not political compromise. This is especially true for carnivores like wolves, grizzly bears and cougars. • Protecting wildlife in Washington would benefit greatly by WDFW increasing the number and variety of its strategic partnerships, as citizen participation from a broad group of stakeholders will be necessary to demonstrate the public’s strong desire to invest in wildlife conservation. 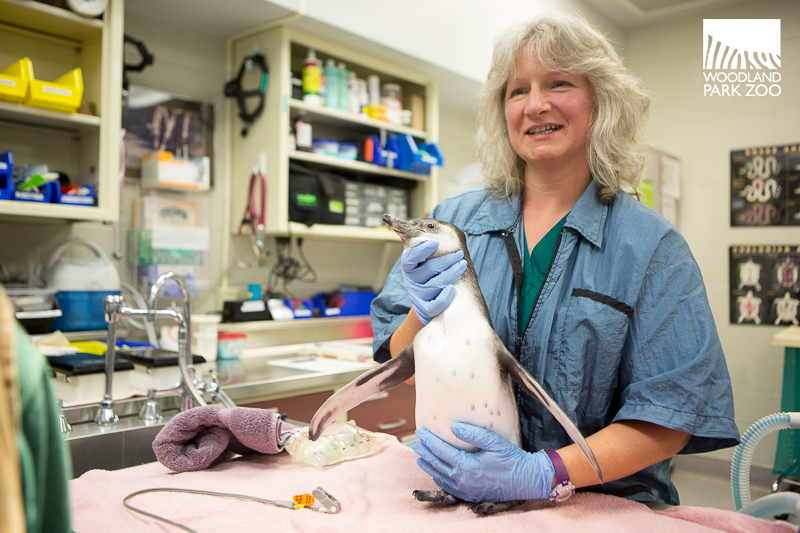 • Woodland Park Zoo stands ready to help WDFW in its efforts to protect our state’s precious wildlife heritage. Please join me in sharing your support for wildlife by participating in the Washington’s Wild Future. Speaking up is one of the most important actions you can make to both save animals and create a sustainable world! Bon voyage, Misawa! 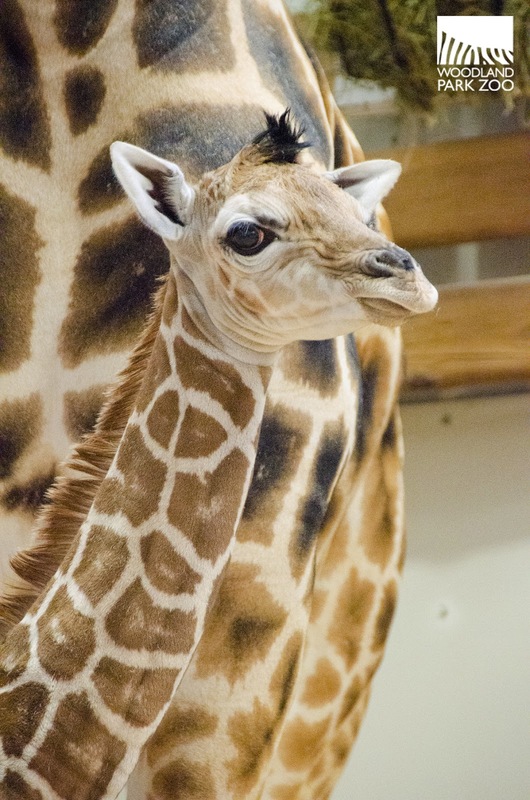 The lovable “grumpy face” giraffe departs zoo in October. Woodland Park Zoo is preparing to say goodbye to its tallest baby, 2-year-old male giraffe Misawa (me-SAW-wah). 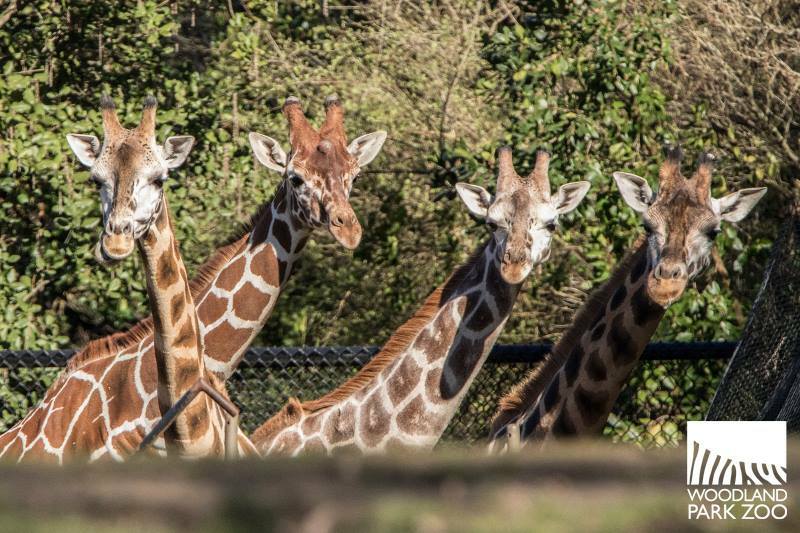 The infamous “grumpy face” giraffe will pack his bags in early October and travel south to Gladys Porter Zoo in Brownsville, Texas to begin his own family. 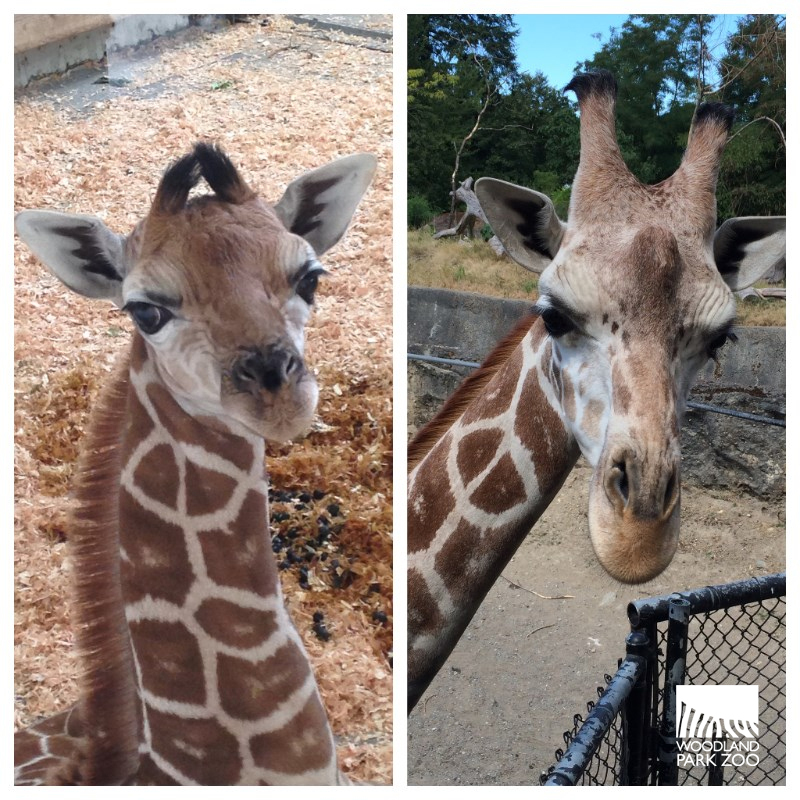 Over the past two years, Misawa has grown from a goofy, long-legged calf into a playful explorer. When he was about 3 months old he began to venture out onto the vast savanna exhibit. While he stayed by his mom Olivia’s side at first, he grew more and more adventurous with time, eventually roaming the exhibit on his own and interacting with his neighbors the zebra, oryx, gazelle and ostrich. 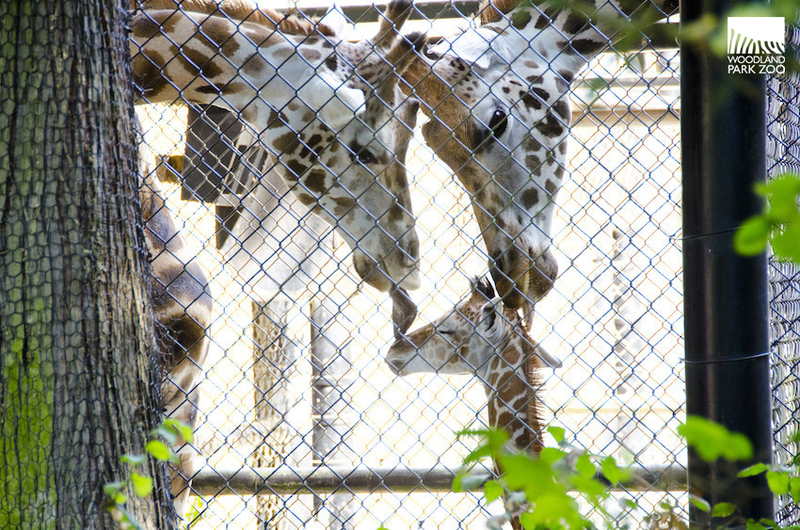 Misawa has been paired with a female giraffe at Gladys Porter Zoo under a breeding recommendation made by the Giraffe Species Survival Plan (SSP), a cooperative breeding program to ensure genetic diversity and demographic stability in North American zoos. Woodland Park Zoo participates in 95 SSPs, overseen by the Association of Zoos & Aquariums. 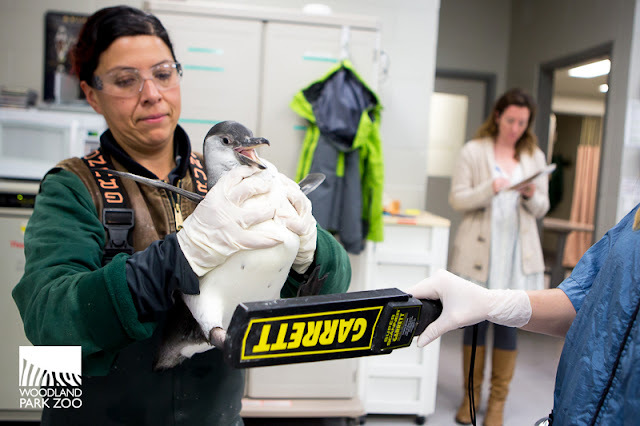 Led by experts in husbandry, nutrition, veterinary care, behavior, and genetics, SSPs manage populations in North America to maximize their genetic and demographic diversity with the goal of ensuring their long-term survival. SSPs also involve a variety of other collaborative conservation activities such as research, public education, reintroduction and field projects. Under the SSP, Dave has been recommended to breed with Olivia and Tufani; the plan is to breed him with both ladies in 2016. 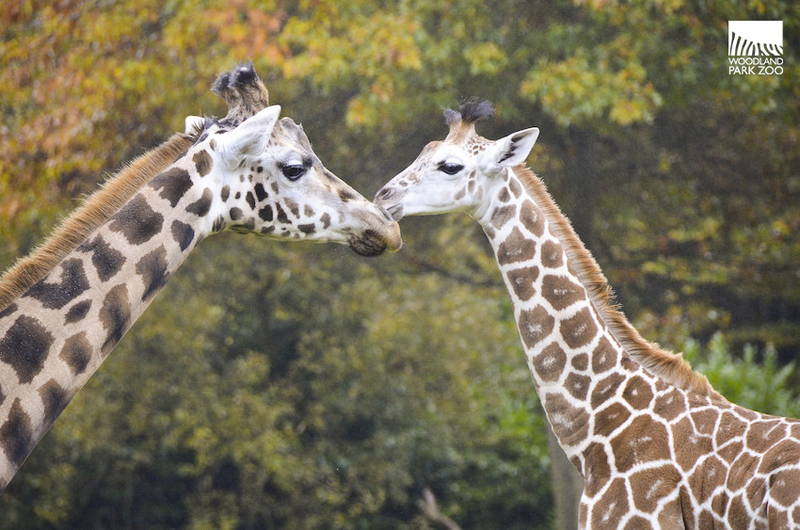 Visitors can see Woodland Park Zoo’s remaining giraffe on the award-winning African Savanna. Bon voyage, Misawa! We are certainly going to miss you! YUS Rangers conducting monthly patrol of the densely forested YUS Conservation Area. Photo: TKCP-WPZ. Steep mountainous terrains, thick dense forest, and narrow walking tracks shifting due to landslides and floods. The environment I live in is extremely harsh and unforgiving, and may seem uninhabitable. But our people have been living here for many generations. Here, we build a hut, plant a garden and hunt for our food. We collect our water, firewood, building materials and food from the surrounding land. We teach our children how to do the same. A great thing about living in this environment – everything is free! We pay no rent or water bills, we do not have to buy our land, and our food and building materials are simply free. All we need to do is manage these resources sustainably. 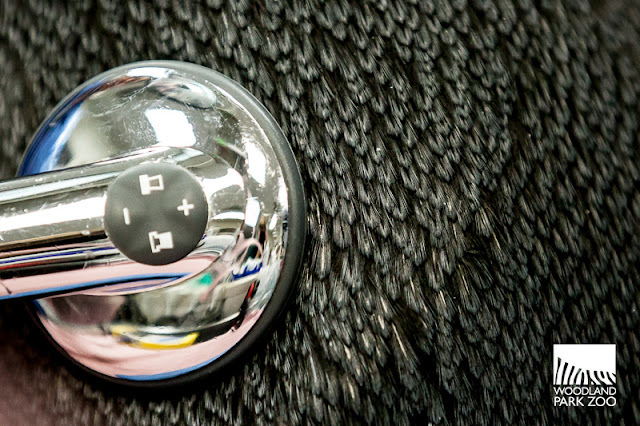 The concept of conservation is not new to us. Traditionally, our village chiefs and elders were entrusted to be the stewards of the land; a great privilege and honor. Some of the land outside of our villages is declared off-limits, or tambu. These areas are believed to be controlled by powerful unseen beings. Trespassers and their families will be cursed with bad fortune or death. These tambu areas then serve as reserves, regenerating and repopulating the entire forest. It is a great honor to continue the legacy of stewarding my environment and its resources. Although the challenge is greater than it once was, Woodland Park Zoo's Tree Kangaroo Conservation Program (TKCP) has trained me to monitor changes in my unique forest, with its incredible terrains flowing with breathtaking creeks and rivers. As a YUS (Yopno-Uruwa-Som) Conservation Area Ranger, I spend one week every month patrolling my environment. Equipped with a Global Positioning System (GPS) device, a pen and datasheet, safety boots, camping gear and rations, I look for the presence of some of our forest’s different animals. I also observe and record any signs of illegal activity within the YUS Conservation Area, and report violators to the landowner to take the matter before the local courts. Community volunteers learn techniques for ecological monitoring in the coastal areas of the YUS Conservation Area, PNG. Photo: TKCP-WPZ. Patrolling in the Conservation Area is no easy task. Some areas are very far from the villages, with steep hills and mountains, deep valleys, and no walking tracks. But, as YUS Conservation Area Rangers, we roam with the strong conviction that our efforts are for the long-term benefit of our people. We walk for miles through the wind, rain and cold, and under the relentless heat of the sun to fulfill our honorable duties. YUS Landowners and community leaders discuss local conservation and development priorities during community-based monitoring workshop in Yawan village, YUS, PNG. Photo: Trevor Holbrook/TKCP-WPZ. Apart from our Ranger work, we also have family to look after. When we are not on patrol, we spend time with our families, tending our gardens and hunting in the hunting zone areas so that our families can enjoy life in this part of the world. Our patrol allowance from TKCP helps us to pay school fees for our children and support our extended family members. It is great to be a YUS Conservation Area Ranger, but it is not without its challenges. The area is quite big, and it can be difficult to cover our entire patrol routes each month. But with the help from community members across the YUS region, we can all contribute by respecting the protected areas and exposing any violations. We must urge our neighbors to adhere so that our children and our children’s children will have the privilege to enjoy the magnificent environment that we now enjoy. 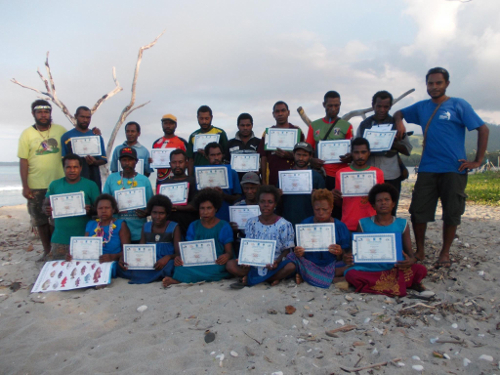 Certified community-based marine monitoring volunteers from Ronji and Singorokai villages along the coast of YUS, PNG. Photo: TKCP-WPZ. If you visited the zoo during July, you may have seen a group of enthusiastic, orange-t-shirt wearing learners writing in their nature journals at the maned wolves exhibit, designing a scavenger hunt along the Northern Trail, typing away on computers at the building across from Bug World, observing the birds in the Tropical Rain Forest Dome, or reading about animals as they snuggled up in the den on the Discovery Loop. ZooCrew students practice reading and writing at the zoo. 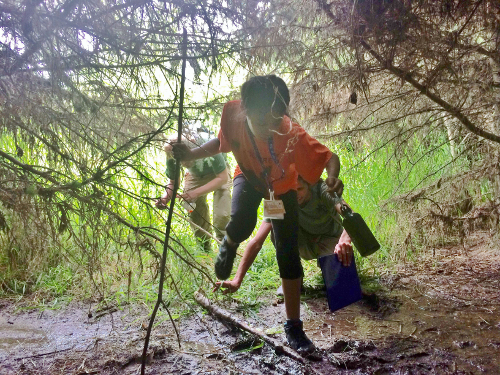 For five weeks this summer, twelve 6th and 7th grade students from Asa Mercer, Washington and Denny Middle Schools explored ecosystems, watersheds and science careers through the ZooCrew Summer Learning Program, Woodland Park Zoo’s middle school outreach program. The ZooCrew Summer Learning Program is a free program in which students participate in nature explorations and science investigations, meet and work with STEM professionals, produce and showcase their own film, participate in leadership and team building activities, and practice reading, writing, math and science. This summer, students not only explored and learned at the zoo, but also traveled all over western Washington exploring ecosystems! We started the summer with an overnight trip to Camp Lyle McLeod on the Kitsap Peninsula. 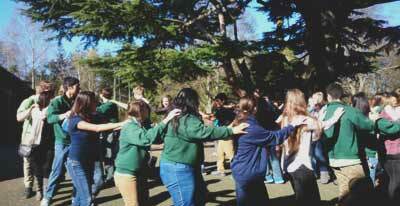 At Camp Lyle McLeod, we played team building games, swam in the lake, canoed and explored nature. We returned from camp ready to dive into an exploration of Washington’s ecosystems with a visit to the Cedar River Watershed Education Center, where we were treated to a behind-the-scenes tour of our local watershed. ZooCrew students canoe at Camp Lyle McLeod. ZooCrew at the top of the Cedar River watershed enjoy the view. In the second week of the program, the ZooCrew students were ready to apply their newfound knowledge about watersheds with a trip to Snoqualmie Pass and the Issaquah Salmon Hatchery where they learned about the top of the watershed. From biotic and abiotic components to producers, consumers, decomposers and more, they learned about the specific parts that make up an ecosystem. The students then started to make connections and learn how an ecosystem works. They also practiced their math and science skills with a water quality investigation to determine if Issaquah Creek was a good habitat for salmon (they found that it was: great news for the Issaquah Hatchery!). ZooCrew students explore the top of the watershed at Snoqualmie Pass. We kicked off our third week learning about the middle of the watershed with an exciting and stinky visit to Brightwater, a wastewater treatment plant and education facility in Woodinville. At Brightwater, ZooCrew students donned safety vests and hardhats to explore what happens to water when it leaves our homes. We saw fertilizer being made, discussed careers in water management, and went on a wastewater scavenger hunt. ZooCrew ready to learn about wastewater management at Brightwater Treatment Plant. The students continued to explore how humans impact the watershed by learning about some of the Woodland Park Zoo’s local Living Northwest conservation projects. We met curator Jenny Pramuk and learned about the zoo’s Oregon spotted frog repopulation project, observed and learned about barn swallow research from lead keeper Gretchen Albrecht and volunteer Anna Martin, and got a peek into the ongoing amphibian monitoring work done by ZooCorps volunteers Sophie, Emily and Katherine. We even got to explore the mysterious world of animal tracking with a field trip to Chinook Bend Natural Area led by IT’s certified tracker (and long-time ZooCrew volunteer) Chris Kluener! 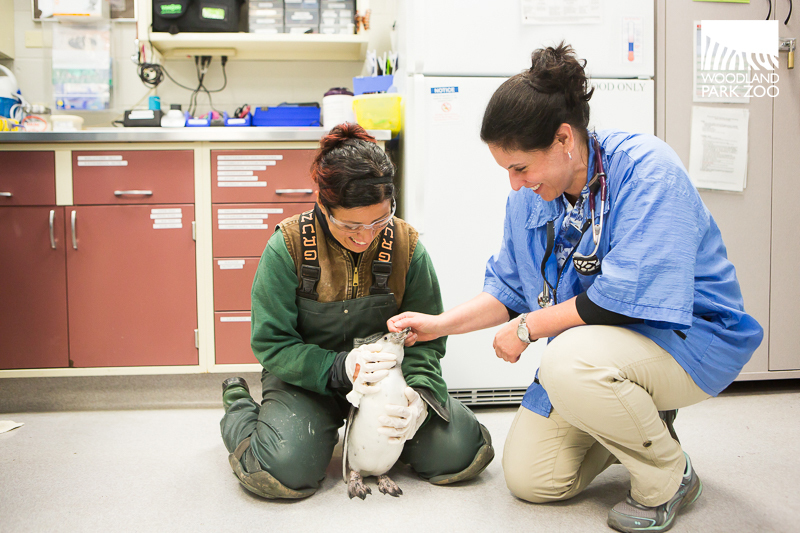 It was an eventful week that taught the ZooCrew students not only about the important conservation work done here at the zoo and in the community, but also about the diversity of urban wildlife living in their parks and yards. Curator Jenny Pramuk gives ZooCrew students a special glimpse into the Oregon spotted frog breeding tanks. ZooCrew students look for signs of wildlife with expert trackers at Chinook Bend Natural Area in Carnation, WA. In our fourth week, we made our way to the bottom of the watershed with a behind-the-scenes visit to the Seattle Aquarium, a day of bird-watching and nature explorations at Nisqually National Wildlife Refuge, a salmon science investigation at the Ballard Locks fish ladder, and a day of tide pooling at Lincoln Park. 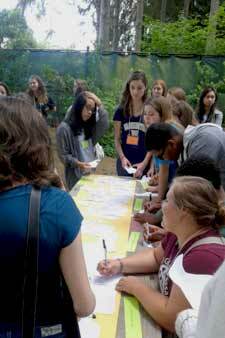 Students got a chance to learn about marine wildlife, wetlands and estuaries. They also continued to practice writing and drawing in their nature journals and learned about how journaling is a tool that scientists use to make observations and record their findings. ZooCrew students use binoculars to observe a Northern harrier at Nisqually National Wildlife Refuge. Students get their hands and feet wet tide pooling at Lincoln Park. Throughout the summer, students also had an opportunity to meet scientists, observe them at work, and ask questions about their career paths. These career expeditions were full of exciting hands-on experiences: making a cloud in a bottle with University of Washington climatologists, meeting an octopus and talking to veterinarians and marine biologists at the Seattle Aquarium, and experiencing a few of the many career opportunities in the zoo world from WPZ’s own ZooCorps summer interns. By the end of the summer, several students were talking about wanting to be zoologists, biologists and field conservationists when they grow up. ZooCrew meeting climatologists at the University of Washington Department of Atmospheric Sciences. ZooCrew learn about marine careers at the Seattle Aquarium. ZooCrew students also spent time throughout the summer filming and photographing their explorations, investigations and experiences. Part way through the summer, professional filmmaker Jonah Kozlowski visited the students at the zoo and led a workshop on filmmaking. In the fifth and final week of the program, the students took what they had learned from Jonah, sorted through hundreds of photos and video clips, recorded voice-overs, and put together a 25 minute film about their summer experience. Not only was the filmmaking project a great opportunity for the students to learn how to make a film, use technology, learn how to use the Movie Maker program and reflect on their summer experience, but it was also a chance for them to learn the importance of sharing their story, practice communication, and develop literacy skills. Students work on editing their film. In the final week, the students hosted ZooCrew’s Family Night. The students took their families and friends on a tour of the zoo and practiced public speaking as they presented their film. ZooCrew students and their families at ZooCrew Family Night! 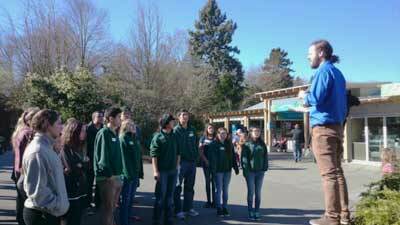 Video: ZooCrew middle school students at Woodland Park Zoo. ZooCrew students enjoy the ferry ride over to Bainbridge Island.